While fresh basil is in season, I try to use it in any dish I can. Instead of making the usual pesto with fresh basil, I tossed pasta with some of the traditional pesto ingredients for a summer fresh dish. Flavorful and fresh, as well as super easy to make on a hot summer night! While the pasta is cooking, toast the crushed walnuts over a saute pan and medium heat, just for 3-4 minutes. Drain the pasta and toss it with the vegan butter and soy creamer. 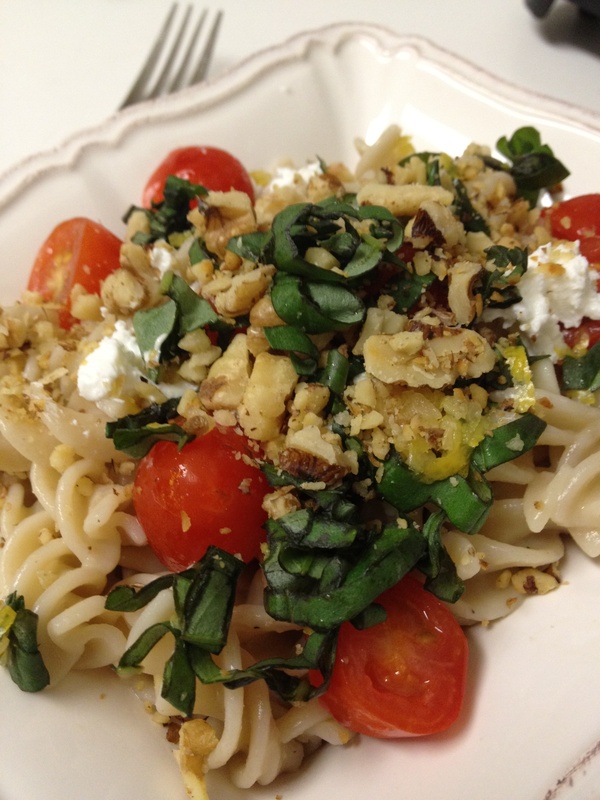 Sprinkle some of the lemon zest, garlic, basil strips, grape tomatoes, goat cheese, walnuts, and salt and pepper.